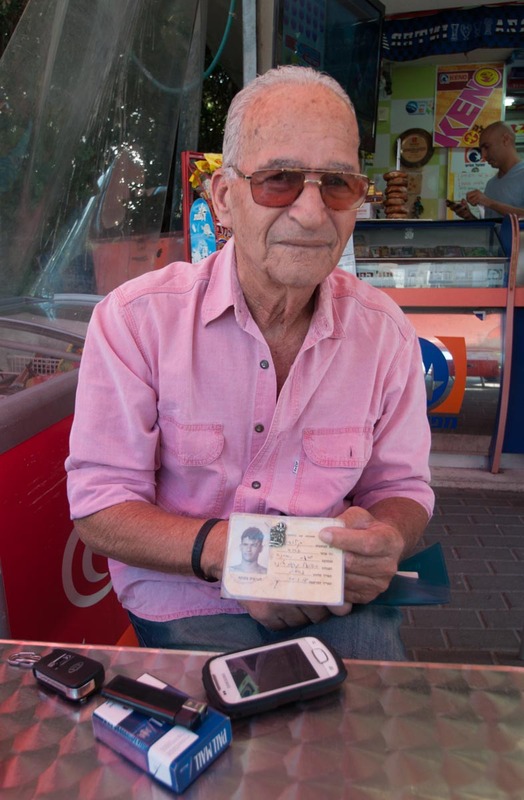 "...masochism is in human nature"
I approached Arieh at a lotto booth, where he sat with some friends drinking coffee and filling out lotto tickets. When I asked if I could interview him and gave him my spiel about my project – “a mosaic of society through interviews with random people” – he immediately caught on: “Oh, so you want to show that people here are human beings too... Sure, you can interview me.” It was as if he had been waiting for a chance to tell his story. He carried all his documentation with him in his taxi and insisted on showing it to me: his war medals and his swimming-championship certificate, with a black and white picture of himself as a handsome 17-year-old. I’m here to gamble. Ninety percent of the time I lose. Ten percent of the time I win. I’ve worked as a taxi driver for the last three years. I used to have a business with two hundred workers. But one day, a friend took me to Prague and brought me into a casino. I didn’t know yet I had this gambling bug inside me. I was the most miserable gambler in the world. Being a compulsive gambler is the lowest level of degradation. I lost everything on the black jack tables. That was eight years ago. I have 3 adult children and 6 grandchildren. My older son and my daughter are lawyers. My youngest son is a student. He’s on his way to become a lawyer as well. My wife divorced me because of my gambling. My parents are from Lithuania. They came to Israel in 1938. They’re from some small village that nobody knows. They never even went to school. They came from large families. When they came here, they left their parents and siblings behind and never saw them again. They all died in the Holocaust. I didn’t have any family beside my parents. I was six years old during the War of Independence of 1948. My mother said “Arieh, don’t worry! Before you are eighteen there will be peace.” We all know what has happened since then. In my opinion, there will never, never, never be peace. We’ll never be able to reach a compromise. Our interests are just too far apart. We’re all suffering; but apparently masochism is in human nature.